Using a stencil is such an easy way to give a fun look to a small, simple piece of furniture like this one. I don't recall where or when I got this little table. It's been moved from room to room and repainted numerous times over the years. Most recently it was pistachio green. I wanted to lighten it up and use it in a guest room that has soft green, blue and peach colors. I repainted it using some leftover paint I have from my coastal powder room makeover. The color is called Pale Pasture from Valspar. Once the paint was dry, I taped a stencil to the middle of the tabletop. To paint this, I used a recipe for DIY chalk paint I found on 2 Bees in a Pod. Jennifer and Vicki have some beautiful pieces of furniture they have restored and painted with their home made chalk paint. Plus, their tutorials make it sound very doable. I purchased some Plaster of Paris and mixed it with some leftover white latex paint. It mixed well and was easy to apply. I will definitely be using their recipe when I take the plunge and decide to paint an entire piece with it. For today though, this small project was the right one for me. I made sure the first coat was dry and then applied a second one. Once that was dry, I carefully removed the stencil and I was happy with what I saw. Since this table isn't going to see much use, I just used a spray polycrylic sealer over the stenciled pattern. The Palmetto Roses in a DIY vase, a trinket dish and a couple of rattan fans go well with the table and other decor in the room. It now has a home in one of our guest rooms. After making the DIY chalk paint and using it, even on such a small scale, I am more confident going forward that I can do an entire piece. Now, I've just got to decide what my first chalk paint furniture piece is going to be. I think a trip to the thrift store is on my agenda. The table turned out beautiful! Love the stencil pattern that you used. I'm in the caboose with you on the chalk paint train. I've been thinking about trying it out too. I'll have to check out that chalk paint recipe! Thanks for sharing! Thank you! I'm pretty happy with it. Yes, do check out their recipe. It works great and it's a fraction of the cost of buying it! Thank you, Brittany. I'm happy to share at #HomeMattersParty. Thanks for stopping by! Hi Jennifer, thank you! I was so pleased with how great your DIY chalk paint recipe is. You ladies are awesome for sharing your recipe! I'm excited to try it out on a larger piece. Thanks so much for visiting. Thanks! I was very happy with it. I'm off to check out your project. Thanks for visiting! Beverly, this is really beautiful- you did a fantastic job on it. I want to paint and stencil ALL of my furniture today. Oh, dear, now look what you've done! Ha! I love that you included the chalk paint recipe- thank you! 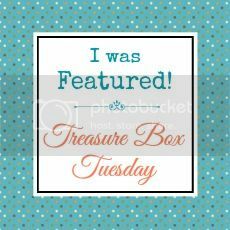 :) And thank you for sharing this with us at Treasure Box Tuesday- pinned! This turned out really nice. My paint always gets under the stencil and looks all weird. You did an awsome job. I love the little stencil pattern, just gives this little table a lift. Thank you so much, Joy! I've been eyeing lots of mine, too! Vicki and Jennifer have some amazing projects using their homemade chalk paint, so I wanted to be sure to give them credit and send people their way. Happy to share at Treasure Box! Thanks, Michelle. I was worried that would happen with this, but I tried to make sure I had it taped tightly and brushed in instead of out. Thanks so much for stopping by! Thanks, Bernadyn! And thanks so much for sharing it. Thank you! That's just what I was hoping for. Thanks for stopping by, Julia. Beverly, Thanks for linking up your cute little stencil table and sharing it at the Brag About It link party this week! I'm always happy to link up at Brag About It! So pretty. I love the subtle contrast. Super cute, love how it turned out! Thanks so much for linking up with Idea Box! Thanks, Danielle! Happy to share at Idea Box. Oh wow! Thanks so much, Dee! This is so pretty! Thanks for sharing at What'd You Do This Weekend? I hope you will join us again this Monday morning! Thank you, Joy. I was happy to share! See you Monday! Oh! I'm so excited! thank you, Joy! I'm delighted that you like it. Thanks so much for visiting! We'd love to hear from you.